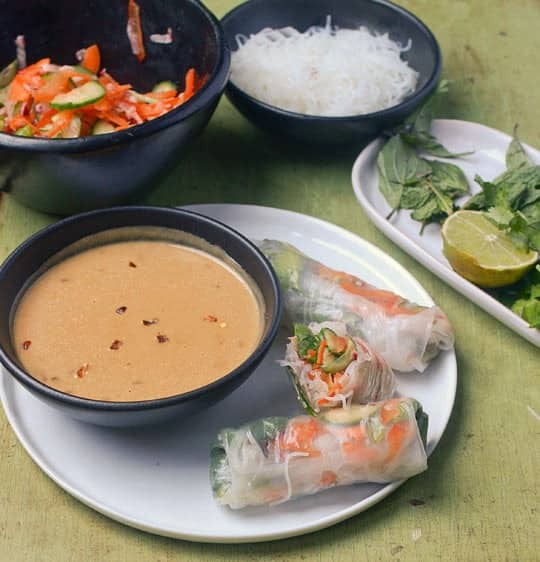 How to make refreshing summer rolls with vegetables, mint, and a spicy peanut sauce. 1. 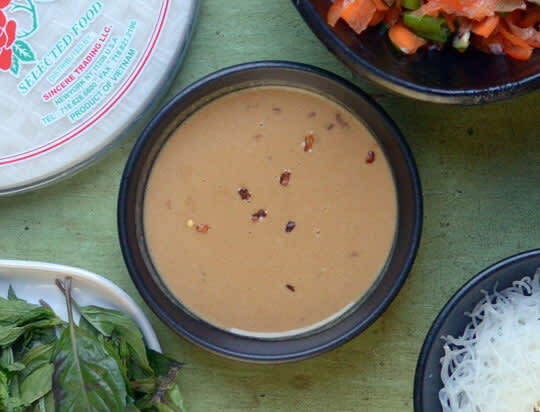 Make the spicy peanut sauce: Whisk together all the ingredients for the sauce until smooth and creamy, and set aside. 2. 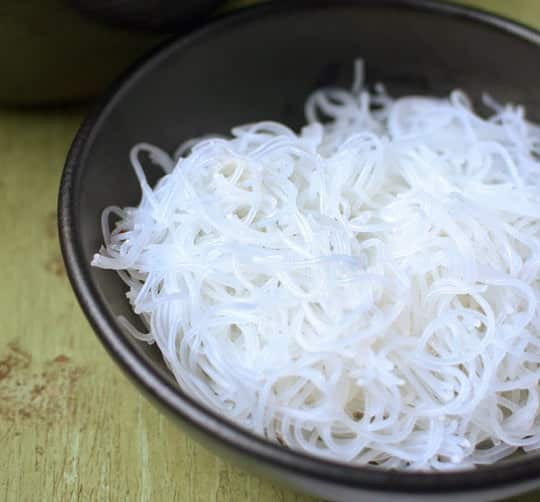 Make the rice noodle filling: If the cellophane noodles are very long, break them into smaller bits. Cook the cellophane noodles according to the package directions. We heated a medium saucepan full of water until almost boiling, then turned off the heat, added the noodles, and let them sit for about 10 minutes. Drain the noodles, put them in a bowl, and toss with the sesame oil and a dash of red pepper flakes. 3. Make the vegetable filling: Use a mandoline or box grater to slice the cucumber, carrot, and red pepper into thin strips — or simply julienne by hand. If you are using large radishes, you can slice them on the mandoline or box grater. Or just slice into thin rounds by hand. 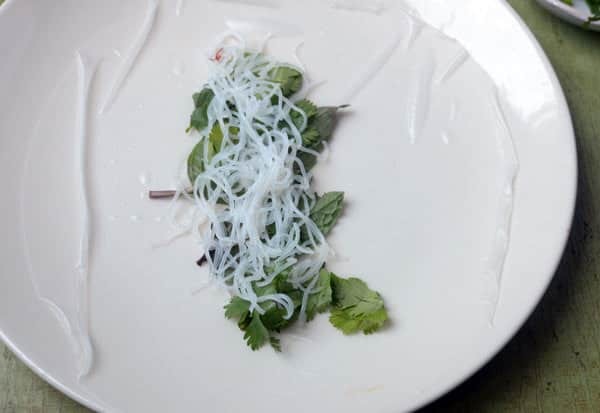 Whisk together the rice vinegar, sugar, fish sauce, and lime juice in a large bowl. Add the vegetables and the scallion, and toss to coat. 4. 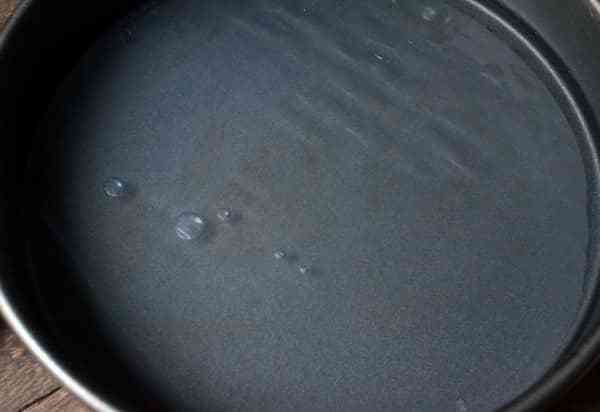 Soften the rice wrappers: Fill a round cake pan halfway with warm-hot water. (It should be quite warm, but cool enough to stick your fingers in it without getting burned. We let boiling water cool off for about 5 minutes.) 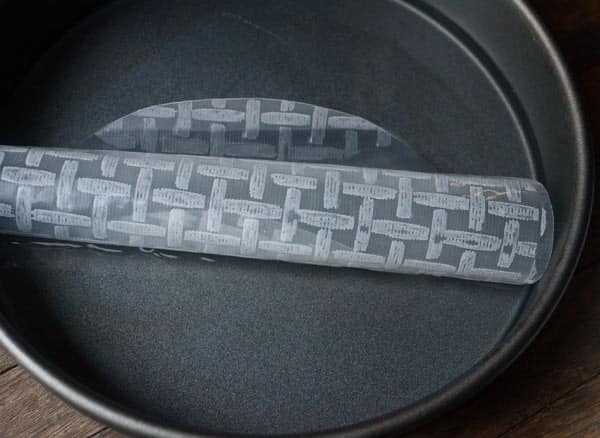 For each wrapper, immerse it in the hot water bath until it softens, which takes about 30 seconds. Watch for it to begin curling, then immediately flip it over and continue flipping until it is just softened. Use both hands to pull it up out of the water, being careful so it doesn’t collapse on itself, and spread it immediately on a plate. 5. 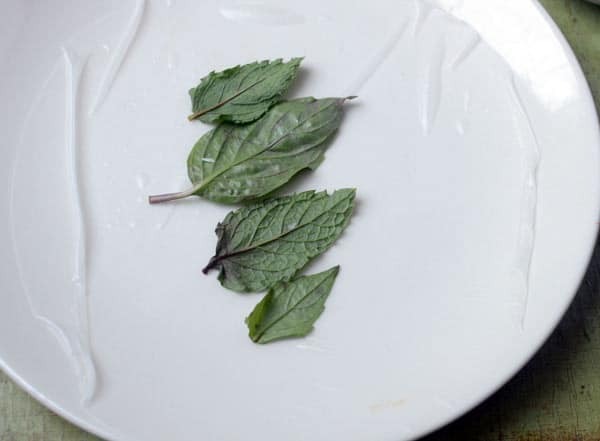 Put filling in the center of the wrapper: Fill the center of the softened wrapper first by laying about 3 to 4 herb leaves down the center. Then lay down about 1 to 2 tablespoons of noodles (you want to have enough for 8 rolls). Then, add 1/8 of the veggie mixture. Add a few sprigs of cilantro and 2 to 3 mint leaves, depending on how large they are. …then fold in the edges towards the center and continue rolling the filled wrapper until it’s closed and snug. Continue this process with each of the wrappers. You may need to change your hot water halfway through. As you finish each roll, place it on a cookie sheet and cover the rolls with a damp towel. To serve, slice in half with a sharp knife and serve the peanut sauce on the side. 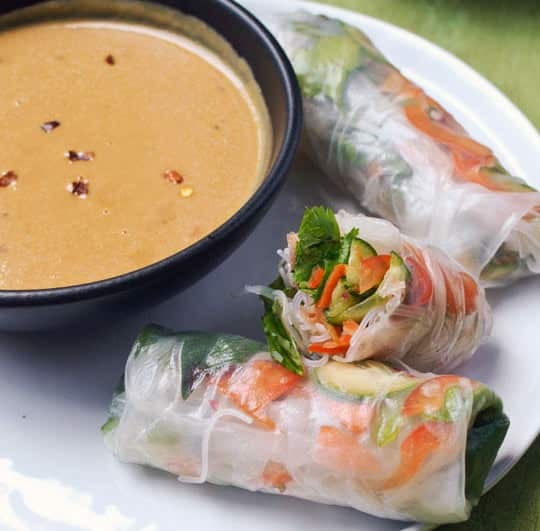 Here is one of our favorite Asian dishes for a summer lunch or warm evening — fresh spring rolls (also called summer rolls). 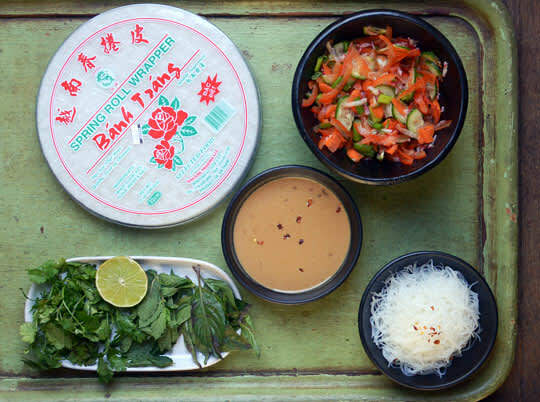 Heaps of fresh mint, shaved vegetables, and light rice noodles wrapped up all ready for a spicy, tangy peanut sauce. They are healthy and light, and so refreshing in the heat of summer. Want to see how to make these? They’re super easy. 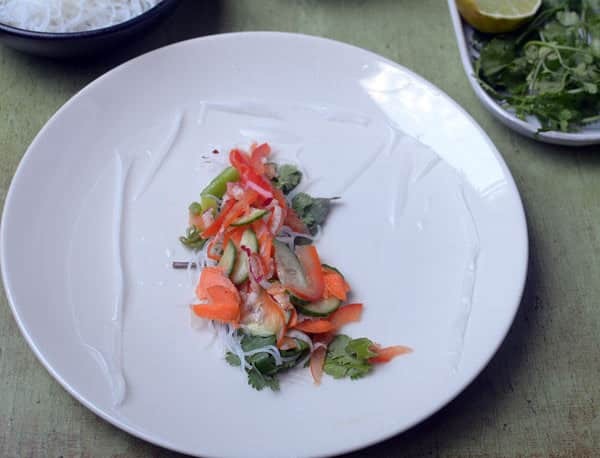 This recipe uses a mixture of red pepper, radishes, cucumber, and carrot, which we threw in the rolls with cellophane noodles. 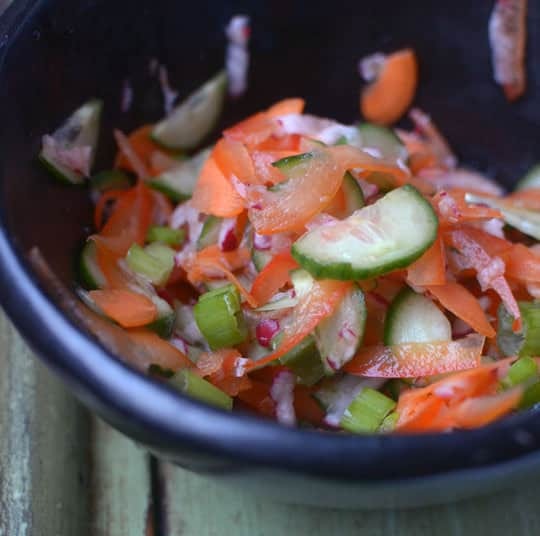 Since we love the flavor of fish sauce with lime juice and rice vinegar, we seasoned our veggies with that combo. Then we added cilantro and fresh mint leaves. We’re in love with these pretty rolls! They were a perfect light, crunchy lunch, and we’re planning on eating a few for dinner, too. 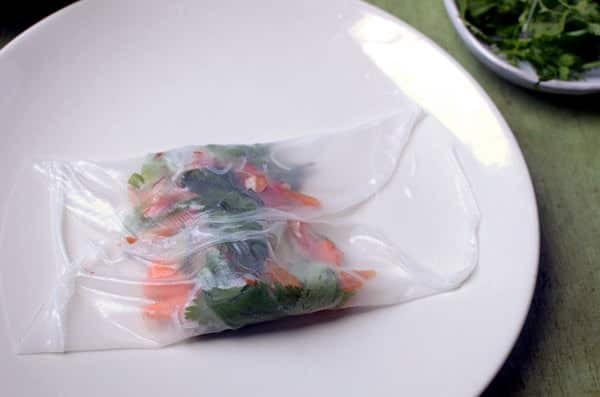 This was our first experience with rice paper wrappers, and they were surprisingly easy to use. This recipe can be adapted dozens (hundreds?) of ways, and it’s a great way to start experimenting freestyle with Asian flavors. 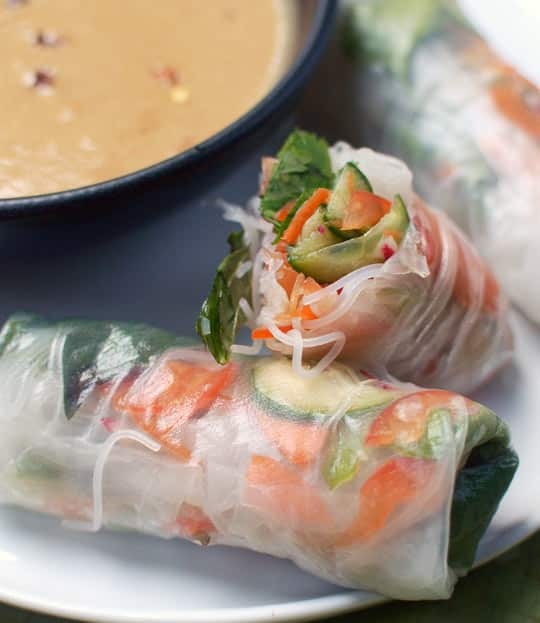 Because we didn’t include any shrimp or meat in these summer rolls, we wanted a hearty dipping sauce. Ours is a peanut sauce with lots of red pepper flakes, but you could make a lighter sauce with just lime juice, rice vinegar, a bit of sugar, and some fish sauce for salt and depth. 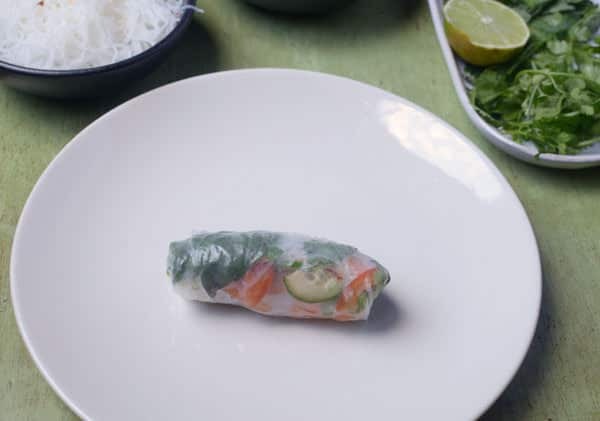 And don’t be scared of rice paper wraps! We found them in the first Asian grocery. Softening them in hot water is easy — we give tips in the directions, below.